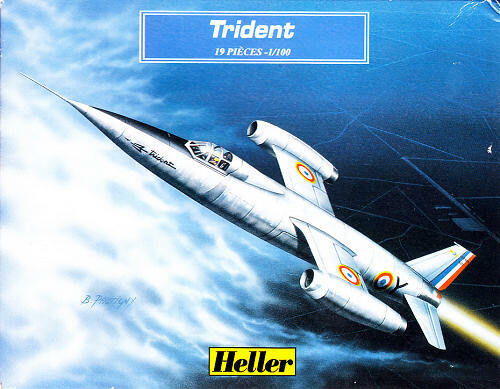 The SNCASO SO.9000 Trident 1 was a mixed power prototype designed to a French Air Force requirement for a point interceptor. Main thrust was to come from a SEPR 481 rocket motor augmented by a pair of wing mounted Turbomeca Marbore turbojets. First flight of the first of 2 airframes was on March 2 1953. In over 100 flights a maximum height of 65,000 ft was reached with a top speed of Mach 1.6. The second airframe crashed on its first flight later the same year. The first prototype is preserved at the Musee de l’Air. 10 examples of a more developed version, the SO.9050 Trident 11, were ordered but the project was cancelled in the late 1950s. This is one of a number kits by Heller in this scale and may have been originally released in the late ‘60s or early ‘70s in the Cadet range. 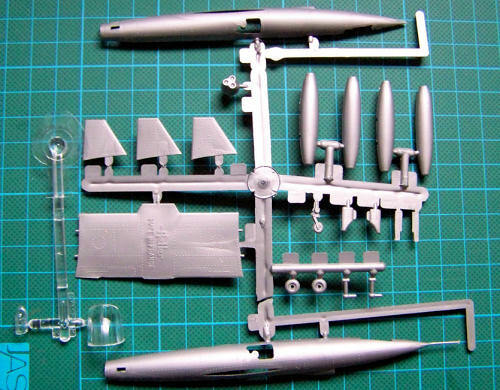 The kit is made up from 21 parts including a single clear part for the canopy. Surface detail consists of large over scale rivets and raised lines for the control surfaces. The smaller parts are devoid of detail and have mold seams and flash. Ejector pin marks are present on many parts but these are on the inner faces and will not be seen after assembly. Some of the larger parts have flow marks as well. Instructions call for 1g of weight to be placed in the nose. The cockpit is just an empty hole but details wouldn’t be seen thru the supplied canopy anyway. Looking at the image of the parts you will notice that there is, on the right, a second clear part included, this has no connection with this kit. It is o bviously an aircraft canopy, perhaps it is for one of the other 1/100 kits? The decal sheet is matt printed and typical of Heller sheets of the time. The French roundels are printed in 2 parts with the centre blue dot separate, however the yellow outline unfortunately varies in thickness. Black anti-glare panel and 3 white panels are included to make painting easier. The instruction sheet is a double-sided A3 item with a 7-stage construction sequence on one side and a painting and decaling guide on the other. This would be a suitable kit for a beginner and would be an unusual shape in a collection of 1/100 aircraft.